As NASA’s Pluto probe nears the planet, it managed to grab some spectacular photos of its small moons for the first time. The New Horizons spacecraft is now in position to view the entire Pluto family. “Detecting these tiny moons from a distance of more than 55 million miles is amazing, and a credit to the team that built our LORRI long-range camera and John Spencer’s team of moon and ring hunters,” principal investigator Alan Stern remarked on the discoveries and the people behind them. The moons themselves have been glimpsed only in the space of the last two years, though scientists knew of their existence before: the gigantic Charon – in July 2013; Hydra and Nix – in July of the following year and January 2015, respectively. We’re now up to Kerberos and Styx – the smallest and faintest of the Pluto family that NASA has released. 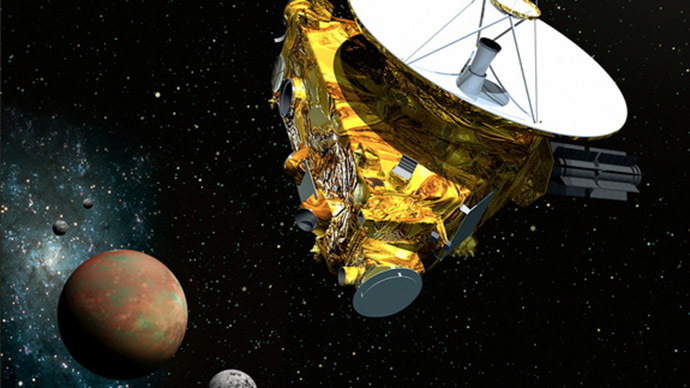 The probe is to perform its first-ever Pluto flyby on July 14. As it draws nearer to its destination, the objective is to capture as much exciting stuff as possible. The moons made the list, but so do the possible rings and potential other, undiscovered moons. The question is if there are any potential dangers for the probe as it approaches. The campaign of weekly observations began on May 11. Up to July 1, New Horizons will snap away at anything remotely interesting with its huge camera. Having set off on its journey all the way in 2006, New Horizons is the fastest probe ever launched, traveling now at 52,416 km/h (32,570 mph). Interestingly, while the probe has got a very strong shield made of Kevlar – the material now widely used in things like bulletproof vests – the breakneck speed means a collision with even a two-millimeter-sized piece of debris could end the entire mission before it even reaches Pluto. That’s why the probe is keeping a sharp eye on everything – let alone huge asteroid belts. "New moons might be shedding dust into the system, into a place where we can encounter it," Spencer explains. He doesn’t believe the probe will randomly slam into an undiscovered small moon, but does say the chances of spotting new ones are still pretty high. The question remains – if New Horizons does encounter danger on approach, what could it do to get there safely and avoid damage, which, in all probability, would prove disastrous? Two choices arise, according to the team: using the probe’s high-gain antenna as a shield, or to change course. The two could be used in concert, if need be. But the first option isn’t all that attractive, according to Spencer: "That change would hurt our science significantly, because we wouldn't have the freedom to point in all the directions we'd like," he told Space.com. As for the course changes, three trajectories have been established. The most interesting one would take New Horizons deep within Charon’s orbit. Though, again, that could present problems. The arguably less interesting routes one and two would not impact science delivery as much as the third option. The exciting news in all of this is that even if it were to take precautions and change course, New Horizons would still have enough fuel to explore beyond Pluto. NASA is currently discussing details of the potential mission.